Vernal swales on the summit area of Table Mountain. 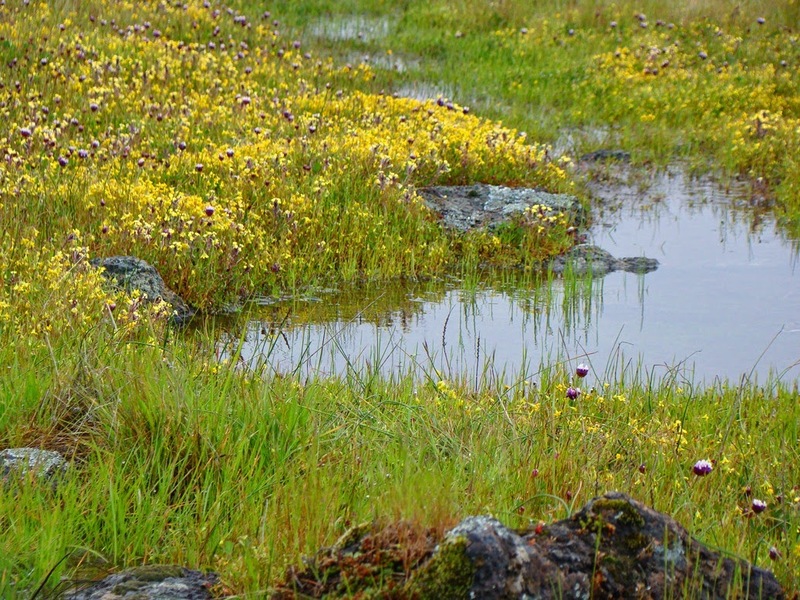 These have some similarity to vernal pools on the valley floor but are also different in some important respects. Click on this post for more info. Word comes today in the Modesto Bee that a local "farmer" has been fined $160,000 and ordered to purchase conservation easements worth $1,000,000 after he oversaw the destruction of 33 acres of prime vernal pool habitat. He was in the process of converting 850 acres of leased grazing acreage to an almond orchard when his tractors "deep-ripped" 380 acres, including the vernal pools. He had been warned to get a ground-working permit from the U.S. Army Corps of Engineers, but he didn't do so. He was confronted by officials on September 12 who stopped the tractors, but the damage had been done. The investor responsible said only that "I want to farm. That's all I want to do". No, he wanted to cash in, pure and simple. He knew he was flouting the law, and the penalty is appropriate. 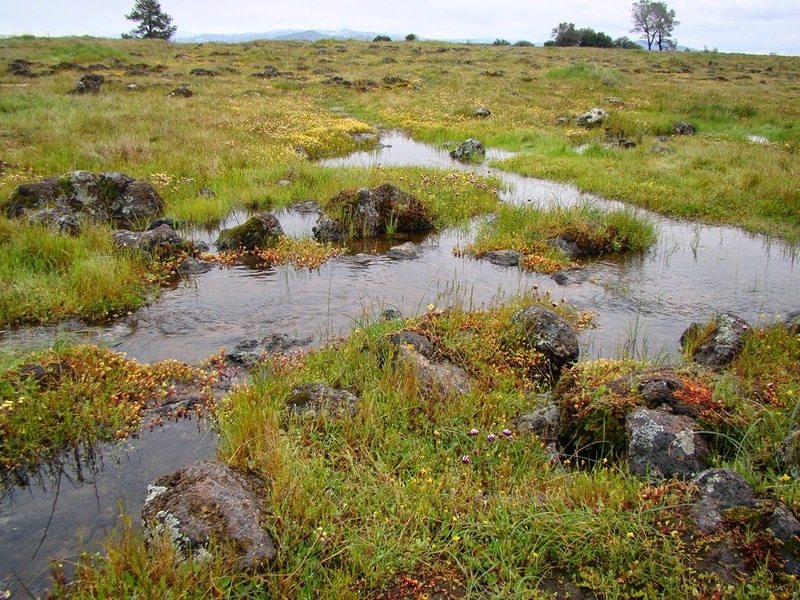 Vernal pools are one of the most unique aspects of the California prairie of the Great Valley and lower foothills of the Sierra Nevada. Many endemic species thrive in the pools, and they provide an incredible show of wildflowers in the spring (See this post for an example of the richness of the environment). They are a precious resource that deserve protection, and indeed many of the remaining pools are being preserved, at least on paper. They are defenseless against lawless land-developers, apparently. 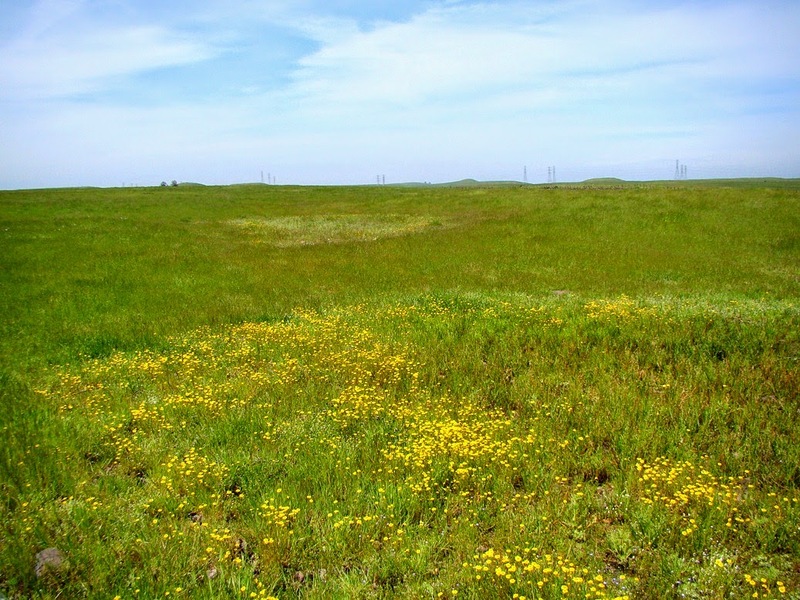 There is very little of the original California prairie left, no more than five or ten percent. A lot of what is left has already been altered by grazing, but such lands are not getting particularly worse under that form of land use. It seems we hear that this new development or that one will only take only a few more acres, and a few more. Repeat over and over, and the last of the pools will be gone, especially if the politicians go through with their plans to restrict the power of the Environment Protection Agency and other government organizations to do their jobs and enforce the law. As the Bee article points out, People can comment on the proposed penalty by Dec. 18 by emailing r9hearingclerk@epa.gov or sending mail to Steven Armsey, U.S. Environmental Protection Agency, Region IX, 75 Hawthorne St., San Francisco, CA 94105. I hope you will consider writing and supporting the penalty. The water pirates are trying to cash in on the almond craze, and this landscape can ill-afford to be abused in this way. The water isn't there for the long term, and the orchards will die. But not before they've pulled every little bit of short-term profit they can. So many trees, so little water to keep them alive. But profit is profit. It's a crime that the last vernal pools are being destroyed this way, and it is ultimately for a money-making scheme that is futile anyway. I talked about the groundwater issue a few months ago, and I am cutting and pasting the information below. Water is the ultimate controlling factor that will leave this as a wasted, barren landscape. It's a sad and familiar story for California: there is a valuable resource in the ground, free for the taking. There are those who come to exploit the resource, tearing up the land and leaving behind a wake of destruction. There are no laws to control the behavior of the miners, except for a few arcane rules from a previous century. In the end the resource is gone, and so is the chance for any sustainable use of the land for future generations. In the end, it was all about money, which landed in the hands of a few powerful people. It certainly didn't benefit the ones who did all the physical work. This could describe the effects of the California Gold Rush of the 1850s, but unfortunately it is not. It is a story that is happening right now in my neck of the woods (prairie? ), and the worst of the destruction still lies ahead. And right now, there isn't a whole lot anyone can do to stop it. It's not gold, it's water. And despite the fact that gold is worth somewhere around $1,000 an ounce, the water is far more valuable. Our local paper, the Modesto Bee, has been running a series of reports recently including this one by reporter J.N. Sbranti that should receive much wider exposure. Almonds have become a valuable and profitable commodity these days, and there is a wild rush on to plant as many acres of almonds as possible. In many cases farmers are simply switching from corn or other yearly crops and putting in orchards. 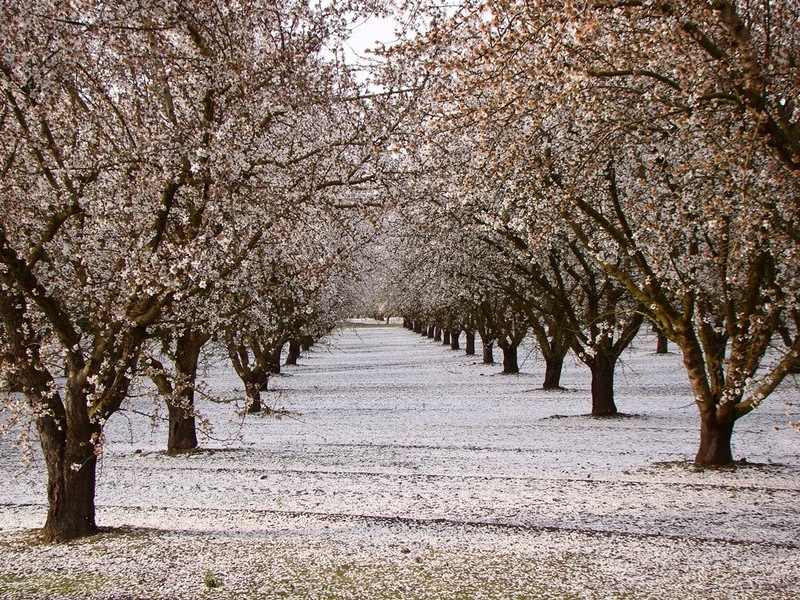 The most destructive aspect, however is the planting of some 30,000 acres of almonds and other nut trees on the former prairie and grazing lands east of Modesto adjacent to the foothills of the Sierra Nevada. The problem with the trees on the valley floor is that one can't let the fields lie fallow in the driest of years like the one we are now suffering through. The trees must be watered or they die, and they require 4 acre-feet of water per acre each year. If the water gets prohibitively expensive, so what? They'll have to pay the price. California's version of "snow". The almonds are beautiful when they are blooming. What's worse are those almond orchards in the foothills. They can't be irrigated by normal means, as there is no infrastructure to deliver water there from the local irrigation district. The only source of water is from the ground, and there are few if any rules regarding the use of the groundwater. The large agribusinesses simply buy up the cheap grazing lands, put in the trees, and start pumping vast amounts of groundwater to water them. 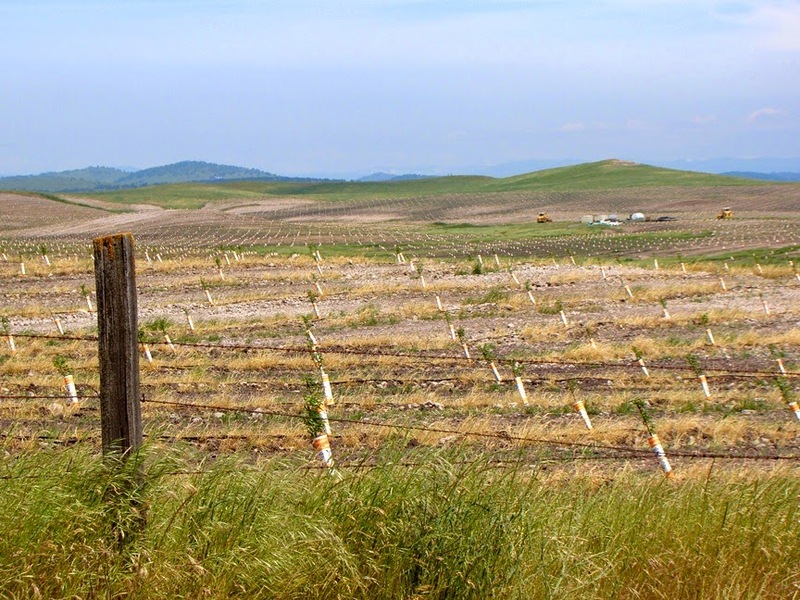 According to the Sbranti report in the Bee, the 30,000 acres of new orchards are consuming 39 billion gallons of groundwater each year, which is more than is currently pumped for domestic use across the entire county. The groundwater resource is limited, and will likely be depleted in the service of these orchards. 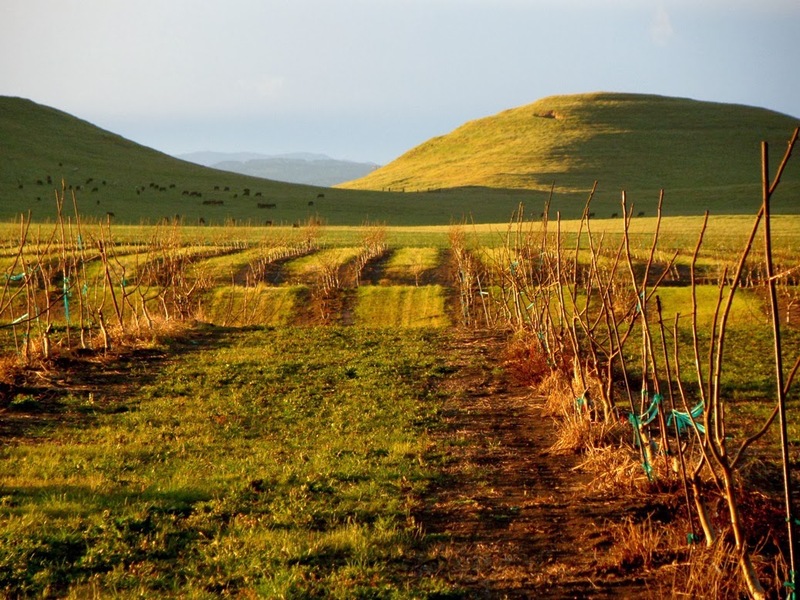 When the water runs out, the orchards will die, but the owners will have gotten their cash. All legally of course, and damn the consequences.